Tonight Lisa made this Chicken & Shrimp Laksa, a curry laksa, adapted from a recipe in Asian Flavors. 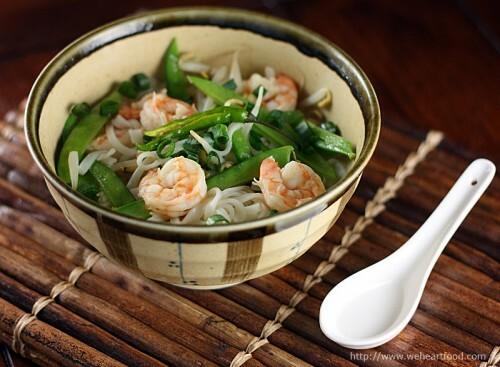 This Malaysian dish consists of wide rice noodles, chicken, and shrimp in a nicely seasoned coconut broth; stir-fried bean sprouts and snow peas add crunch, color, and texture to the soup. I think it needs just a little salt and a little bit of Sriracha. Those noodles really soak up that broth; seems like it thickens as it sits. I like it. It would be really good with mushrooms and carrots… next time I’ll add those in. Yum! And we’ll have to find shrimp paste; our anchovy-paste-and-fish-sauce substitute probably wasn’t quite as intense. Well there you go, now we have an excuse to make it again. Soak the rice noodles until they are tender. Heat half the oil in a large saucepan and fry the shallots over low heat until softened. Add the garlic, lemon grass, shrimp paste, red chili, and coriander and continue to cook over low heat for two to three minutes. Stir in the chicken broth, coconut milk, and sugar and bring to a simmer. Add the chicken, shrimp, and noodles and leave over a low heat until the chicken is cooked through. Meanwhile, heat the rest of the oil in a wok and stir-fry the snow peas and bean sprouts for two minutes or until they start to soften. Spoon the laksa into serving dishes and stir in the snow peas and bean sprouts. Garnish with scallions, and extra chili peppers. We recently picked up the full-color edition of Steven Raichlen’s Barbecue Bible, and this is the first recipe we’ve made from the book. If this one is any indication, I’m guessing we’re going to have a great time grilling this summer! In this recipe, shrimp is briefly marinated in lime, salt, and white pepper, and then dipped in mixture of the same. Very simple, and it came together extremely quickly. I love grilled shrimp — it cooks so fast that it’s in my mouth that much sooner. I really like the dipping sauce. Very limey. It’s been a while since we’ve had shrimp and left the shells on — a bit messy while eating, but they seem more flavorful. It looks like I ate a ton of food with all these shells on my plate. You know, we could probably use these shells for something. Yep — if you don’t want to toss them, you can use those shells to make paper or dress wounds. Oh. Yeah. That makes more sense. Rinse the shrimp under cold running water, then drain and pat dry with paper towels. Place the shrimp in a large glass baking dish, sprinkle the lime juice and 1 tsp each salt and white pepper over them, and toss to coat. Let stand at room temperature for about 10 minutes. Meanwhile, cut the lime lengthwise into 4 wedges. Put a lime wedge in each of 4 small shallow bowls or dishes. Place a small mound of salt (1/2 tsp) on one side the lime wedge and a mound of white pepper (1/2 tsp) on the other. Set aside. Set up the grill for direct grilling and preheat to high. When ready to cook, brush and oil the grill grate. Arrange the shrimp, in their shells, on the hot grate and grill, turning with tongs, until the meat is firm and pink, about 2 minutes per side. Transfer the shrimp to serving plates. 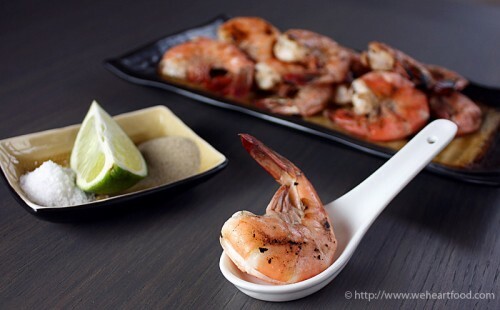 To eat, squeeze the lime wedge over the salt and pepper and stir two or three times with chopsticks; peel the shrimp and dip it in the lime mixture. A few nights ago I made this surprisingly easy and quick rice dish — somewhere between a paella and fried rice — found in The Border Cookbook. We used chicken chorizo instead of pork/beef to lower the fat content, and considering there’s only a teaspoon of oil added, it was pretty healthy. Yeah, it’s good. The dish itself is pretty subtle, so I think it works well to have the distinct spices from the sausage and the contrasting cool avocado. 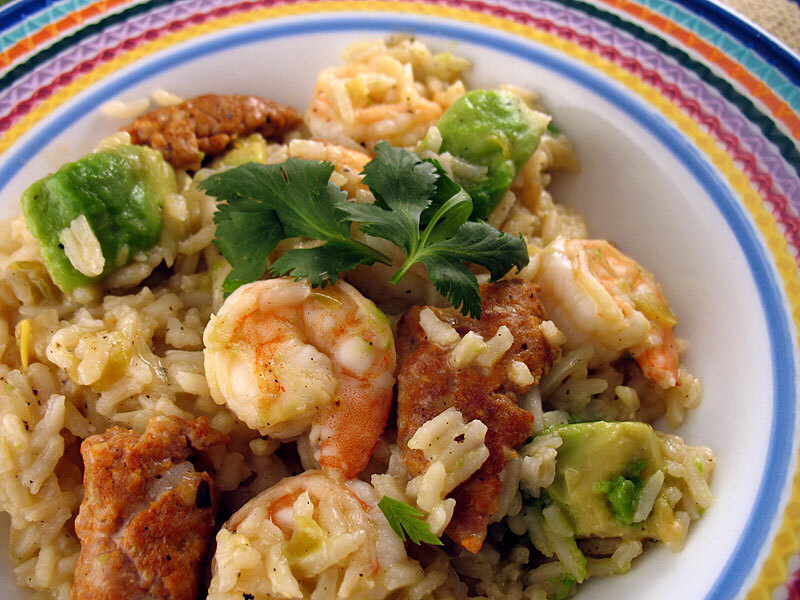 I really like this dish — you’re right, it’s reminiscent of both fried rice and paella. 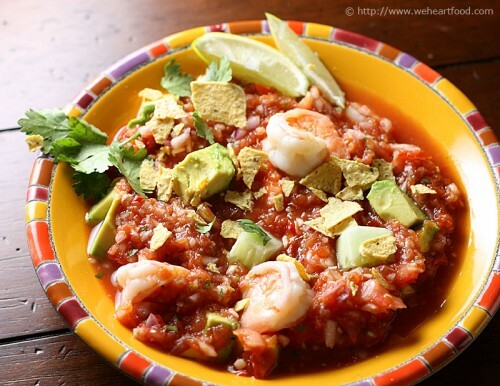 This would be good topped with some of that tomatillo-chipotle salsa that we made with the Arroz Con Pollo. In a heavy skillet, fry the chorizo in oil over medium heat. When just browned, add the onion, garlic, and rice and saute briefly until the rice is translucent. Pour in the stock, soy sauce, vinegar, add the bay leaf, and bring to a boil over high heat. Reduce the heat to low, cover, and simmer for 15 to 18 minutes until most of the liquid is absorbed. Stir in the cooked shrimp, avocado, and pureed tomatillos, cover again, and continue cooking for 2 more minutes. Remove the pan from the heat and let the rice steam, covered, for at least 10 minutes. Stir and serve. Carrie was over tonight to enjoy the first recipe we’ve made from Asian Flavors, a book we’ve been sitting on since Christmas. The chapters in the book are divided by ingredients (for example: lime leaf, coconut, etc. ), and the recipes in each section feature that key ingredient. 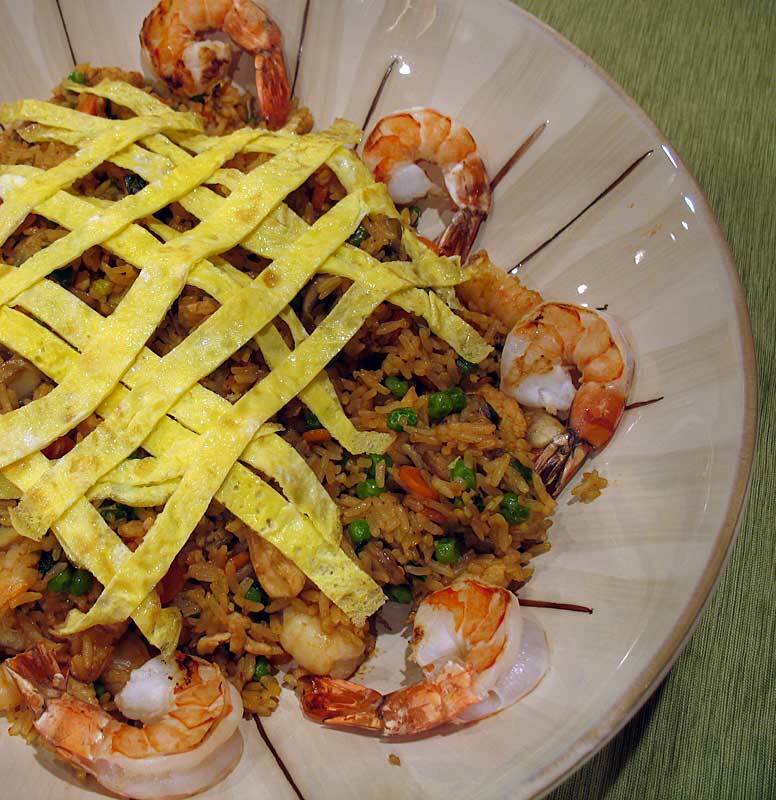 This fried rice dish was featured in the Soy chapter and uses kecap manis, a thick, sweet soy sauce used in many Indonesian dishes. Now *this* is a Carrie dinner! Mmmm… I like the little egg on top. I’m usually not a fan, but this is really paper-thin. Yum, I like this dish! Cathy will be glad to hear we finally made something from the book. So you just followed the recipe exactly? Pretty much… used a bit less oil than listed below… so there was some sticking to the wok… but that’s a small price to pay! Prepare and cook the jumbo shrimp as desired (I marinated in lime juice and grilled them on skewers). Mix together the first three ingredients and set aside. Heat two tablespoons of peanut oil in a wok and stir-fry the scallions and carrots for two minutes over medium heat. Add the mushrooms and garlic and stir-fry for another two minutes. Remove and set aside. Add 1 tbsp of peanut oil to the wok, increase the heat to high, and stir-fry the chicken for two minutes. Return the vegetables to the wok, add the peas, rice, and small shrimp and pour in the sambal oelek mixture. Toss the ingredients together over the heat for three minutes until piping hot. Pile into a serving dish, arrange the jumbo shrimp around, and transfer to a low oven to keep warm. Heat the remaining peanut oil in a small skillet, add the egg, and cook until it sets as a thin omelet. Tip out of the skillet onto a cutting board and cut into strips. Arrange the strips over the rice mixture in a lattice and serve.